Sam Son is only two and a half hour drive from Hanoi on the way to the South. The beach is exceptional with its natural beauty and unspoiled charm. 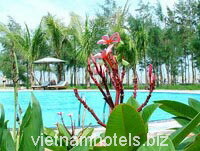 Van Chai Resort is situated right in a private white sandy beach. We bring you close to nature in hotel accommodation, facilities and services. Enjoy this paradise by relaxing under the pine and coconut trees on the beach and experience our wide choice of food and beverages. You can also join the exciting trips to the Doc Cuoc Temple, Co Tien Pagoda and the Truong Le Mountain. You will discover the excellent service and gracious hospitality for which the Vietnamese people are renowned. 60 spacious rooms, suites and family suites (42 rooms are in villas), each with their own sea-view balcony. Red brick walls, bamboo & clay furniture, large comfortable beds with handcrafted decorations and most bathrooms have open -air showers. 28 superior twin and double rooms are structured in Vienamese - village atmosphere where people have their own privacy and at the same time feel very close to their neighbours. Inclusive of 12 Superior Garden View room and 16 Superior Ocean View with total are from 30- 45 sqm/room. 8 deluxe rooms offer you space with a touch of colonial architecture. Total area - 65 sqm/room. 4 suites are following as unique Vietnamese architectural concept. 2 family suites, each consist of two bedrooms, living & dining - room, kitchen and huge sea-view balcony where you can feel comfortable as in your sweet home. Total area - 125 sqm/unit. Van Chai Beach Restaurant and Bar introduce the flavors of Vietnam at their best. Vietnamese cuisine lovers will have a chance to sample innovative Vietnamese dishes. This is the best place for superb beachside dining, light meals and snacks. Meeting rooms for 250 people and 100. 40, 10 people and events settings.